Come and take part in Kendal Cycle Club’s social, sportive for all abilities! 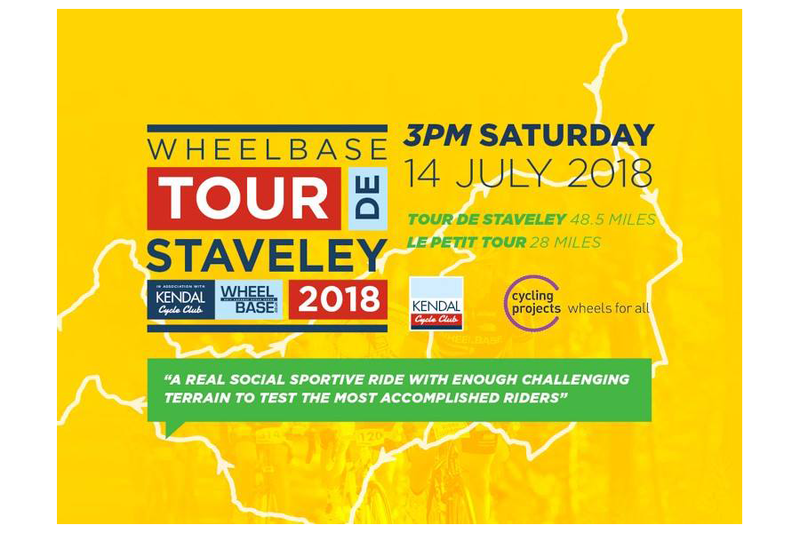 Now enjoying it’s 10th anniversary Le Tour de Staveley boasts two stunning Lakeland routes. Last year, the sportive raised £500 for Cycling Projects, Wheels for All. This year, all proceeds from the event will go to the charity. Starting at WHEELBASE with a feed station positioned 3/4 at Hare & Hounds, Bowland Bridge. Both distances take in fabulous scenery and famous climbs before finishing with a 2-course dinner in served up by the Wilf’s with the days Tour de France action playing on the big screen.